the world’s greatest Mexican restaurant empire. In early 2007 we started working with Chipotle on updates and enhancements to their newly launched website. Over the next couple of years we completed many additions to the Chipotle site, as well as other interactive projects (email campaign micro-sites, online ads, etc.). 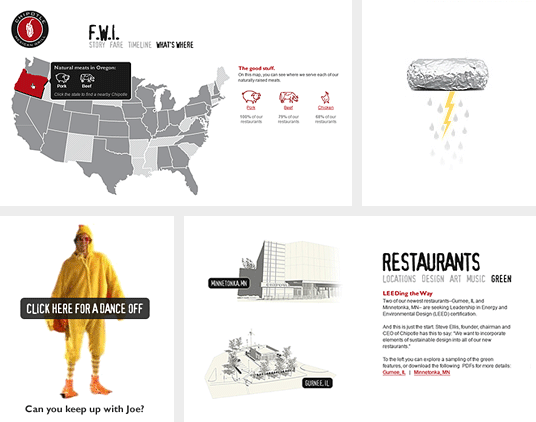 We took great care to ensure all new pieces maintained not only the established visual style of the Chipotle web site and brand, but also stayed true to the vision of the original site as a fun, whimsical and sometimes wacky experience.